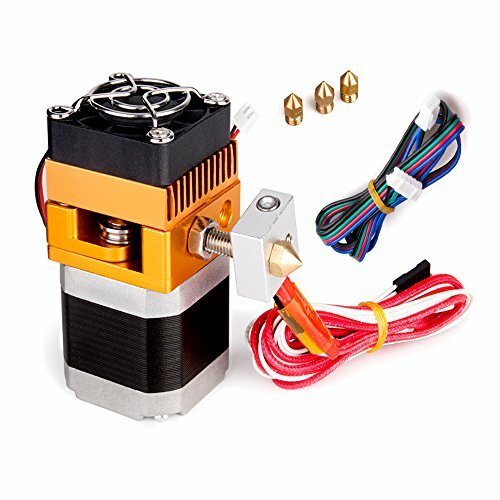 MYSWEETY mk8 extruder, come with assembled, support 1.75mm pla, abs, flexible tup, wood filaments and so on, widely used in prusa i3 3d printers, especially for Reprap, MakerBot, Anycubic, Hictop Mendel prusa i3 3d printers. ❥Make sure the maximum temperature is less than 280°C. ❥Thermistor sensor is risky demaged if it is fasten too tight.And please do not be panic if it is fallen out as arrived ,it is easy to reset. ❥Compatible with most prusa 3d printers with some slight modifications,if you would like to install on Anet A8,please cut the thumb bar of the extruder frame for carriage mounting. Assembled mk8 extruder come with 4 print nozzles; Diameter: 0.4mm defaulted; 0.2mm, 0.3mm, 0.5mm optional. It is compatible with most prusa i3 3d printers with some slight modifications when mounting it. Filament size: 1.75mm PLA/ABS or other 3d print materials. Flow rate of nozzle:max 100mm/s, support for high speed printing. Nema 17 high quality stepper motor with larger torque and less heat buildup. Special ceramic insulation cotton ensure the hotend can heat to a high temperature fast and stably.